Ashley Narcisse, Author at Know Money Inc.
FinCon is a financial conference that equips the personal finance community with the skills and knowledge to better serve their audiences. This year was my first FinCon experience and, admittedly, it was a lot of information to take in. However, I want to share the top five things FinCon17 taught me and how you can use this information to improve your finances. Lynette Khalfani-Cox was one of the “Big Idea” speakers and used the Matrix effect to describe the future of finance. This looks like a form of technology that's similar to the Amazon Echo Dot; it uses everything about you (health, shopping habits, work, etc.) to help you make better financial decisions with a simple command. This may sound scary, but it’s actually a beneficial way to get customized financial advice anytime you want it. Cinch Financial is on the leading edge of this sort of technology. The key takeaway from this is: everything about you impacts your money! If you’re looking for financial success, pay attention to some of your smallest habits and begin taking action to improve them. Teaming up with like-minded individuals to communicate your goals and struggles can propel your situation from “meh” to amazing. FinCon was created out of ideas bounced around in a mastermind group. It started with a need for community and support and is now the top personal finance conference for bloggers, writers, podcastors, etc. Millions of dollars in collaborations and brand partnerships have come out of FinCon. The key takeaway from this is: Find an accountability partner or group! Unbiased support and partnerships are game-changers for any type of success. Farnoosh Torabi was also a “Big Idea” speaker. She talked about how no matter what level of success you achieve, you have an obligation to do more. Making and managing money starts off as a self-focused journey, but eventually turns into a service-focused mission. 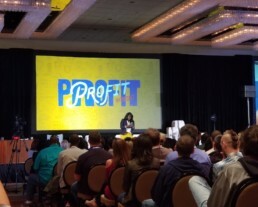 The biggest influencers at FinCon were willingly pouring tips and practical advice into almost everyone they encountered, without any expectation of something in return. They’ve amassed major success, yet found more value in their service to others. The key takeaway from this is: Your family, community, and future generations depend on you to make and manage money responsibly. This was very clear on day one of the conference. Successful relationships and partnerships depend on your ability to listen actively and remain present during interactions. Real value is found in the stories behind the person sharing the information. The key takeaway from this is: In everything you do, have a service-like mentality. Everyone has gifts and a story to tell! This, by far, is my biggest takeaway from FinCon. I thought there was some special formula for achieving mass success, but really it boils down to consistency. Some of the biggest influencers consistently provided content before seeing any sort of success. They kept going even when success seemed out of reach. The key takeaway from this is: Keep going! Creating a solid financial system requires your time, energy, and commitment!